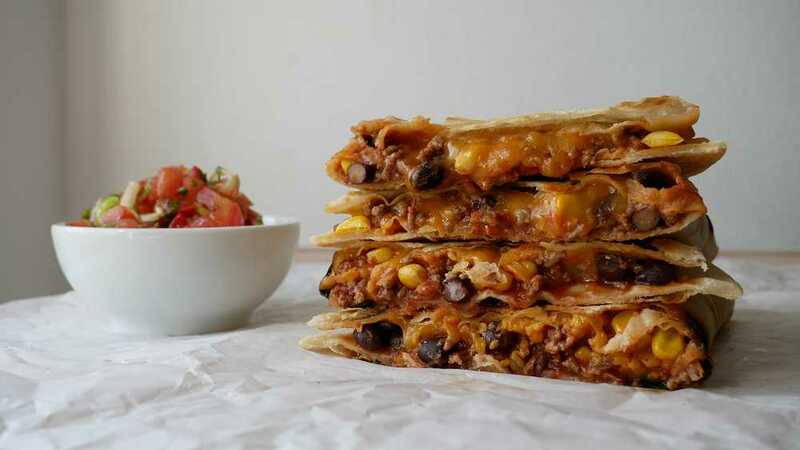 Quesadillas are a classic Mexican dish, which is prepared in many different variants depending on the region you are. Tortilla wraps are usually filled with meat, cheese and vegetables, folded & then baked or deep-fried. In a large mixing bowl combine 500 grams flour, 250 milliliters water, 50 milliliters oil & a teaspoon of salt & knead together all ingredients with your hands or a kitchen machine for 4 – 5 minutes until a smooth dough. 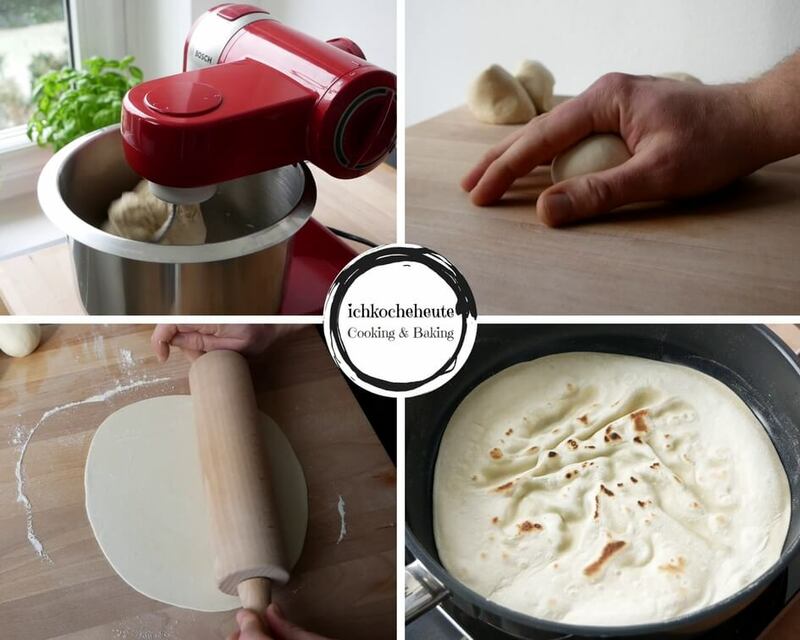 Use a knife to cut the dough into 8 equal sized pieces and shape each piece of dough into a ball. Next, lightly flour the worktop & roll out the dough pieces one by one with a rolling pin until thin and flat to the size of a plate. Afterwards heat up a large pan without adding oil or fat & as soon as the pan is hot, bake the tortillas one after the other at medium to high heat for 1 minute each side. If there are small bubbles on the top, the tortilla wrap can be turned over once and baked on the other side until done. Stack the finished tortilla wraps on a plate and leave to cool with a damp kitchen towel. The damp kitchen towel keeps the wraps soft and makes them easier to fold up later. Cut spring onions into fine rolls. Halve tomatoes, cut out the stalk and then finely dice. Finely chop cilantro. Then put all prepared ingredients in a small bowl and add a pressed clove of garlic. Also add the juice of 1 lime & a good dash of olive oil and mix well. 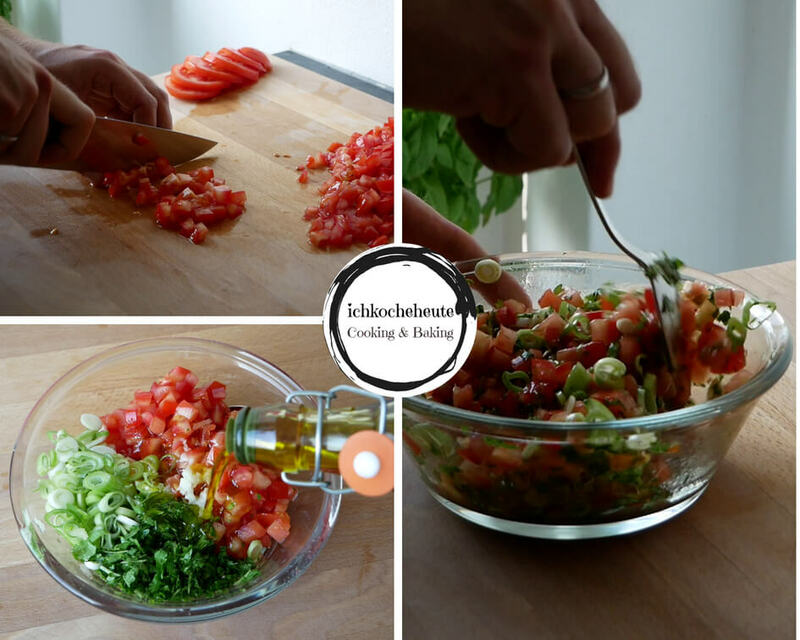 Finally, season the tomato salsa with a good pinch of salt, pepper and sugar & set aside until serving. Peel an onion and cut into thin strips. Also peel off 1 – 2 clove(s) garlic and finely chop. Pour off corn and black beans over a pasta strainer and rinse thoroughly, then allow to drain. Afterwards heat up a large pan adding a dash of oil and sweat onions and garlic for 1 – 2 minutes over medium heat until glassy, stirring occasionally. 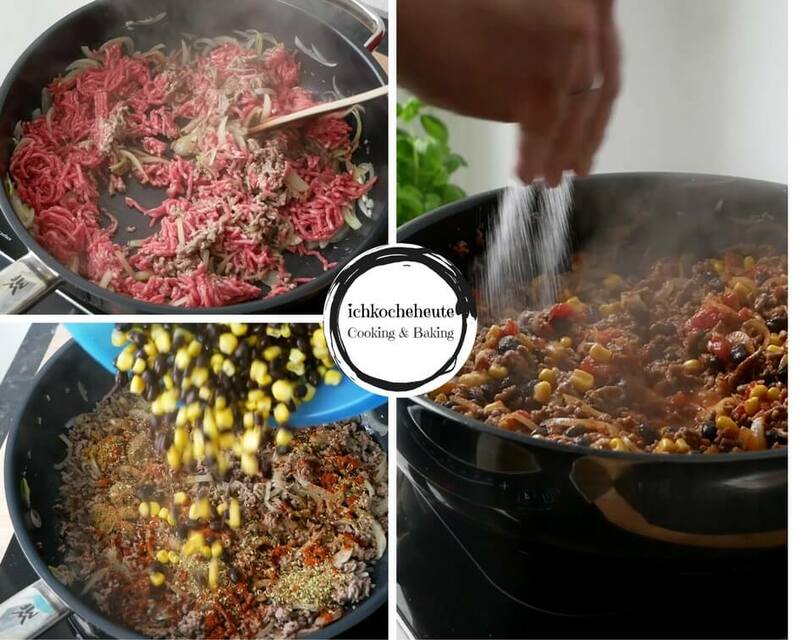 Next, increase the heat slightly, add the minced meat & sauté for 4 – 5 minutes until crumbly, turning occasionally. Season the mixture with 1 teaspoon each of cumin, ground coriander, sweet paprika powder & dried oregano, also add corn, black beans and 1 can of chopped tomatoes. Stir in all ingredients & warm up briefly (for about 1 minute). Finally, season the minced meat filling with salt & pepper, then remove from heat. 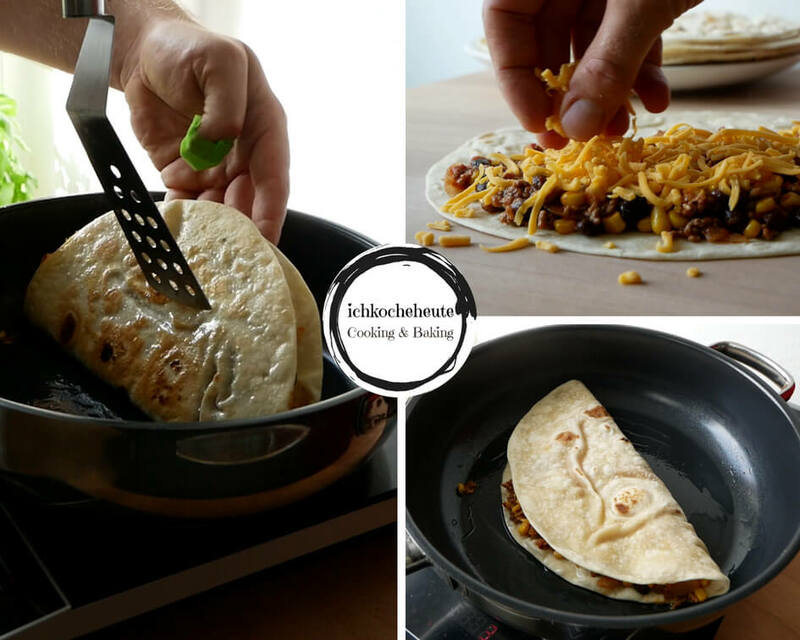 Spread the beef filling halfway through the prepared tortilla wraps & sprinkle them with some grated cheddar cheese, then fold up to a semicircle so the filling is embedded. Next, heat up a large pan adding a dash of oil and brown the folded quesadillas each side for about 1 – 2 minutes over medium heat until the cheese is melted inside and the tortillas are crispy on the outside. Lift the done quesadillas out of the pan (possibly keep them warm in the oven if necessary) and serve along with the tomato salsa and a dollop of sour cream. Have fun cooking!